Easy Money and Stats – First Get the carpenter who builds regular houses. Then, When you have about 10000 dollars put all you items into the bank. Go to Guntz and buy all the shave ices you can carry. Then go to Township and cook 3 at a time. you will get goldbars. go back to tunlan and sell the goldbars for 6000 dollars. Then buy 1/3 of shave ices, f. spices, and frisbee’s. Go back to township and cook 3 at a time of each till all you have are stat raising items. after all that you should still have about 10000 dollars. INFINITE COINS – To get infinite coins, store all the coins in your possesion in a bank. Then, go to a church of St. Eva. Select “donation.” Since you have no money, the priest will give you ten gold coins. Store these in the bank. Go back to the churcha and repeat these steps again. It requires a lot of patience, but you can get as many coins as you want. THE FIRE ROCK – When you go to Mt. Fubi for the first time, you can get an item from a chest called Firerock. Save this unless in an absolute emergency. When you get to Tagwoods to fight Baba, use it right when you enter the fight and you should be able to defeat him much more easily. HUNTING TIPS – When you are hunting, there are two animals that you are able to hunt and get roast from. When you are hunting the deer, use Bow because his crossbow can hit it from a range that Katt can’t match. But when you are hunting the boar, use Katt because her speed will be better than Bow’s hunting speed. Sometimes, if you are lucky, a bird will fly by and you can hit it with Bow. If you do, you will get and egg. The egg is an item that acts like a Moondrop. HIDDEN ISLAND STRATEGIES – Here are some strategies to help you. 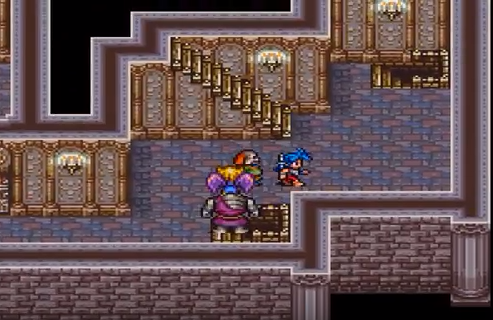 There is a hidden island with Bo and Karn from the old Breath of fire with four different types of strong enemies. A.Sludge has 900 hp and can be killed with a death spell every time it hit’s him. Gonghead has 1000 hp and casts cure4 2 times then runs out of mp so don’t use your magic. Chorking has 25 hp but you only attack it 4 or 5 hp per turn so use item magic to kill it in a single blow. K.Sludge is the hardest and smallest character on this island has 10000 hp. That’s right, 10000. So run away unless you have golddragon. HOW TO GET EARTH SHAMAN – 1. Go to Rand’s mom’s farm house, she will tell to give an offering for good crops at the shrine. 2. You will see some people playing chimes forget about them and continue on to the shrine. You will see an offering table with a bowl on top. 3. Go up and press talk,they wiil ask you if you want to donate 10 coins, continue donating until you have donated 200 coins. 4. Continue and beat the St. Eva church then return to Rand’s mother’s farmhouse to the plowed land. The earth shaman will be there. NAVIGATION OF ARROW TILES IN GRAND CHURCH – To get to the other side of the void in the Grand Church, step on the tile pointong to the RIGHT side of the screen. Next, go DOWN, UP, UP, RIGHT, RIGHT. Then go either UP or DOWN and RIGHT to get the treasure or go to the stairs. FLYING TOWNSHIP – To make your town fly two things must be done. First, any time after you’ve gotten Grandpa the whale, go to Guntz. Then walk straight forward to the house at the back of the town. There is a hidden room behind the bookshelves in the back of the house to the right. Talk to the girl, Eichichi. She will ask a question. To save time just choose “machine”, but be sure to go inside of the well in your town to see the machine. After all that has been done, continue on until you reach the end of the Grand Church. The old man trapped in the machine is the hero’s father. Do NOT kill him! Instead, use attacks which damage only one enemy (such as “Freeze” and the hero’s smallest dragons). Destroy the eyes and you will automatically free him. When you warp back to your town, talk to Eichichi in the well. Finally, the hero’s father will agree to allow you to use his strength. There are a few things you can unlock in Breath of Fire II cheats they are listed below. Her special ability is Shed. This allows her to totally regenerate her HP an unlimited number of times, and it also will cure any ailments (i.e. poison, curse, etc.). In addition, she’s as fast as Katt! RECRUIT PARTY MEMBER BLEU – Go where the crypt is and to the left of it is a beach where you see a circle shape, go into it and you see blue sprits,talk to them then go back to hometown, go to the magic school and at the second floor go to the left room and talk to the woman on the left bench and she is bleu and she will force herself into your party. If you are lucky enough to own an action replay you can use the below codes in Breath of Fire II cheats on the SNES. If any of the codes do not work, or if you know of any that do work that I did not mention please post about it in a comment below. If you are lucky enough to own a Game Genie you can use the below codes in Breath of Fire II cheats on the SNES. If any of the codes do not work, or if you know of any that do work that I did not mention please post about it in a comment below. This code also gives boosts to the main char + some misc boosts to others. If you are playing Breath of Fire II on Snes9x (Or another SNES emulator which supports cheat codes) there are a ton of cheat codes you can use. You can basically use any of the codes listed under the Action replay codes + Game Genie Codes sections, you simply need to enter the required code as per below. Question : Can I use all of these Breath of Fire II cheats SNES Cheats? Answer : The cheats I have listed under “Normal Breath of Fire II cheats (SNES) Cheats” can be used by everyone. You will need a Action Replay or Game Genie to use the cheats listed on this page. Question : Do the Breath of Fire II cheats Cheat Codes Only Work In The Snes9x Emulator? 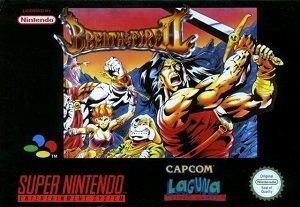 Question : I know a good cheat for Breath of Fire II cheats that is no listed on this page, Can you add it. Question : Do you have any gameshark pro codes for Breath of Fire II cheats? I hope this article on Breath of Fire II cheats (SNES) Cheats + Action Replay | Game Genie Codes has helped you. If you are aware of any tips I have missed off please post about them in a comment below. Please help us out by spreading the word and sharing this article on Breath of Fire II cheats (SNES) Cheats + Action Replay below.